Max Brenner is a confectioner, businessman, and above all, a passionate lover of chocolate. He began his career as an apprentice throughout Europe, where he worked in the best kitchens alongside renowned pastry chefs. It was in Europe that his love for chocolate evolved into passion, leading him to open a small chocolate workshop in his homeland of Israel. Many years later, Max Brenner: Chocolate by the Bald Man is now a thriving international brand, committed to spreading Max's vision of Chocolate Culture to the world. 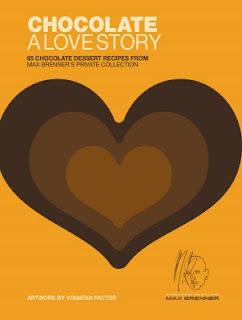 What's not to like about a book full of chocolate recipes? There are tried and trues like chocolate cake, chocolate mousse, sacher torte, and chocolate chip cookies (but these cookies are spiced iwth cinnamon, nutmeg and cloves and have both milk chocolate and dark chocolate chips). There are also some that are new, at least to me--like spaghetti with chocolate sauce, topped with strawberries and toasted nuts. Once all the Halloween candy is gone, I'll have to pick a couple of these recipes and give us all a chocolate fix. However, there are things not to like about the book. The first is that several of the recipes call for raw eggs, and there are no notes telling you to use powdered egg whites or to pasturize the yolks. Secondly,I didn't care for the artwork and general tone of the book. There were few pictures of the food, and lots of 1960's pop-art style drawings. The names of the food had a '60's revolutionary sound to them: "Alternative mild chocolate mousse, Revolutionary rice pudding, Meaningless sweet spaghetti, Contentious chocolate chip cookies". I guess that style of art is one of those things you either love or hate, and I don't love it. The recipes themselves are a bit more complicated than those found in the average church cookbook; however you can make them without committing days and every dish in the kitchen to the effort. The nice folks at Hatchette sent me an extra copy, so I'm passing it on to a reader. To enter, leave me a comment with a favorite chocolate recipe. If you copy if from somewhere on the web, leave a link to the source, but I want recipes, not just links. If you copy it from a book or food package, make sure to credit your source. Make sure your comment has your email address in it. I'll give you up to three entries for three recipes. I'll give you another entry if you blog about this contest and leave me a link to your post. US only--this book is heavy, media mail is a must! Don't enter me. I reviewed this one too. It was actually kind of disappointing. No recipe photos and the recipes themselves were too avant-garde for me. I'm not a big 60s art fan. Mix together, well. Pour in a greased 9 x 9 pan and bake at 350 for 20-25 minutes. Cool. Stir in 2 T. powdered sugar. Spread over mint layer. Chill and store in fridge. Last week I tried the Chocolate Spice Bread at http://stopnsmellthechocolates.blogspot.com/2008/10/would-you-like-chocolate-with-that_10.html. Yum...yumm. yum! And I screwed it up, too, because we were sifting while I was on the phone with my husband and then we forgot to measure how much dry mixture we had, so I know I didn't put enough flour in. It made a gooey, delectable mess that was AWESOME warmed and served with vanilla ice cream and caramel sauce! 1. Preheat the oven to 350 degrees F. Grease 2 9x5x3 in. loaf pans and line the bottom of the pans with parchment paper. 2. Make the Chocolate Batter: In the bowl of an electric mixer, cream together the butter and sugar with the paddle attachment on medium speed, until light and creamy, about 5 minutes. Add eggs one at a time, beating until each egg is completely incorporated before adding the next and scraping down the sides of the bowl several times. 3. Meanwhile in a medium bowl, sift together the flour, cocoa, cinnamon, salt, baking powder and baking soda. In another bowl, whisk together the buttermilk, water and vanilla. With mixer on low speed, alternately add the flour mixture and buttermilk mixture to butter, beginning and ending with the flour and beating just until blended. Divide the batter between the two pans, shake the pans to even the tops and set aside. 4. Make the Cocoa-Spice Sugar Crust: In another small bowl, whisk together the sugar, cinnamon, cocoa, ginger and cloves. Sprinkle the surfaces of both batters with the decorating sugar. Sprinkle with the cocoa sugar mixture, dividing evenly. Bake until a toothpick inserted in the center comes out clean, about 45 to 50 minutes. Let cool completely, run a thin knife around the sides to release the breads and remove from pans. Cream butter with sugar. Add chocolate and eggs and mix well. Sift together dry ingredients and add alternately to batter with milk. Add vanilla. Bake in a greased 9" square baking pan at 350 for 30-35 minutes. This is from Second Helpings Please which I received as a gift many years ago when I was engaged. Line bottom of 13 x 9 casserole dish with cherry pie filling. Spread evenly. Next, add can of crushed pineapple, juice and all, and spread evenly on top of pie filling. Sprinkle dry cake mix on top of these 2 fruits, as evenly as possible. Melt the two sticks of butter or margarine and pour over the dry cake mix. Add the chopped nuts and chocolate chips to the top. Bake at 350 degrees for about 40 min. Serve with ice cream, Cool Whip or whipped cream, as a topping. You do not cut this cake. You scoop it out with a large spoon. It is similar to a cobbler. Note: You can change the recipe for personal preference and use a different pie filling and/or canned fruit instead of the cherry and pineapple. You also can change the topping (nuts and chocolate chips). You also can add coconut and/or cherries to top. You also can use any kind of dry cake mix. This cake definitely can be made to suit personal tastes! And, it is so quick and easy to make! 1. Melt butter; add marshmallows and Milky Ways. Melt over low heat; stir in cocoa crispies. 2. Wet hands; roll in balls. Roll in powdered sugar. Separate until cool. Store in airtight container. This recipe is from Gimme Candy and Cookbooks On/Line. It is quick and easy and fun to make with kids during the holidays. Melt chocolate and butter in a saucepan over low heat and set aside. With a mixer, beat eggs, sugar and vanilla at high speed for 10 minutes. Blend in chocolate mixture, flour and salt, just until well mixed. Stir in the nuts. Bake for 30 to 35 minutes. Do not overbake. While still warm, sprinkle a little bit of sifted powdered sugar to top of brownies. During Christmas holidays, I also sprinkle crushed peppermint to top of brownies (I use a couple of candy canes from Christmas tree and crush the candy canes). Melt margarine in water with cocoa. Bring to Boil. M ix flour, sugar, and salt in bowl. Puur hot mixture over dry ingredients. Add buttermilk, beaten eggs, soda and vanila extract. Beat until well mixed. Pour into greased 9 x 13 cake pan and bake 20 minutes at 350. This is from a easy listening family cookbook. Love this flavor and chocolate throughout is intense. This is light, soft and delightful for anytime. In a blender process the tofu until it is smooth. Combine the chopped chocolate, water, cocoa in a small saucepan. Stir frequently until smooth. Removefrom the heat. Mix in 1/2 c. of the confectioners sugar, a little at a time, until smooth. Add the chocolate mixture to the tofu and process until smooth and well blended. Spoon the mousse into small remakins, cover with plastic wrap and refrigerate for at least 1 hour and up to 3 days. Whip the cream in a medium bowl with an electric mixer until the cream is halfway to soft peaks, then add the remaining 1/2 tsp. confectioners sugar and finish whipping until it barely hold a soft peak. Yummy and light.